For the second consecutive year, the Western Union Foundation Lithuania is giving grants to support non-government organizations and social initiatives in Lithuania. This year, the Western Union Foundation continues to support Education for Better initiative as well as expand its program to a new area, providing support to the development of entrepreneurship in Lithuania. Five non-governmental organizations are going to share 150,000-litas grant in total. One of the grants is dedicated to the entrepreneurship hub Sunrise Valley in Vilnius. According to its director Andrius Bagdonas, this grant is one of the first in the hub's history coming from global companies established in Lithuania. "The most important thing that the Western Union Company, one of the well-known global brands in the world, brings to us is sharing its experience and networking possibilities. Financial support is always important, allowing to provide professional business environment for students starting their own businesses and looking for inspiring environment, consulting and mentors' advices. The grant received from the Western Union Foundation Lithuania gives an opportunity for student start-ups to use working infrastructure for free and consult with international experts," said Bagdonas during the Western Union Foundation Lithuania grant making event that took place in the science and technology park Sunrise Valley on 2 December 2014. By supporting growth of entrepreneurship among students, the Western Union Foundation Lithuania encourages the employees of Western Union to volunteer by providing mentorship, consulting and sharing their own experience with young start-ups to help creating their success. “It is an inspiring example for global companies and their employees in Lithuania”, said Bagdonas. Using the grant received form the Foundation, Sunrise Valley is planning to support 24 new start-ups, organise series of entrepreneurship seminars for more than 500 students and invite selected teams to 20 workshops. Also, the hub dedicated a „WU Start-up space” facilities for new start-ups with the entire infrastructure needed. Western Union in Lithuania expects that this grant will benefit students of Vilnius University and Vilnius Gediminas technical university allowing to create new start-ups with global ambitions. „Western Union believes that every socially responsible company has to give back to a community through financial and more importantly social support. We trust that Western Union Foundation programs such as Education for Better and Economic Empowerment will promote entrepreneurship among young people in Lithuanian. We also engage our employees to contribute to socially responsible projects and encourage them to give back to the society. Almost 80 percent of 1.250 Western Union Processing Lithuania employees participate in social projects and volunteered their time supporting 15 different non-governmental organizations in Lithuania. Our Company encourages employees to contribute to the society by giving one working day off for volunteering“, said Sergej Sidorov, president of Western Union Foundation Lithuania. He added that Western Union Processing Lithuania employees have volunteered more than 2,500 hours during this year. „As a purpose-driven organisation we established Western Union Foundation to support the development of the communities and customers we serve. Through its focus on secondary and vocational education, the Foundation helps create a better world, where the ability realize dreams through economic opportunity is not just a privilege for the few, but a right for all. 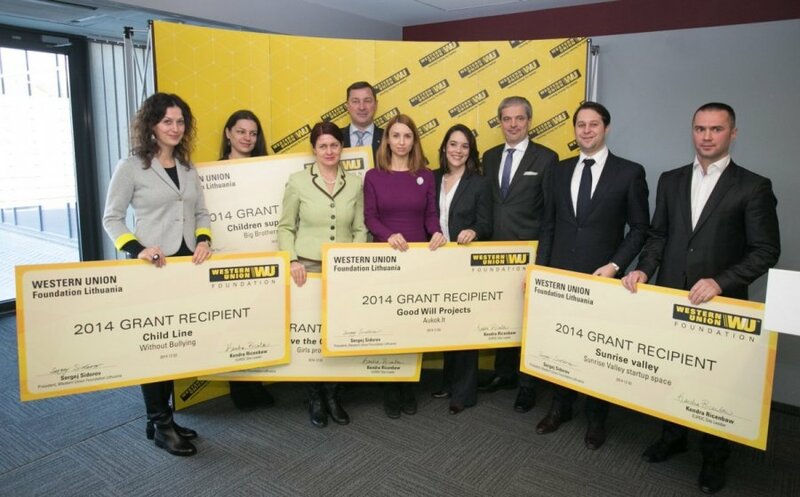 At Western Union, we are proud to create shared value and make a positive social impact. We believe that our business and philanthropic efforts help millions of people develop the skills they need to change their world, and set the foundation for enhanced economic opportunity“, said Kendra Ricenbaw, Western Union Lithuania Managing Director. In 2014, Western Union Foundation Lithuania continues to support Education for Better program by giving grants to 4 different social initiatives and NGOs: Aukok.lt, Save the Children, the Child Line and Big Brothers Big Sisters. The Western Union Foundation Lithuania was set up in 2012. The entire support is received from donations of the employees of Western Union Processing Lithuania as well as its parent company Western Union Foundation. All funds of the Western Union Foundation Lithuania are made available to support social projects in Lithuania.